This is the third part of the series, in which our Research Fellow Matthias analyses thousands of recordings from the UK singles charts using audio signal processing techniques. You can read Part 1 here and Part 2 here. 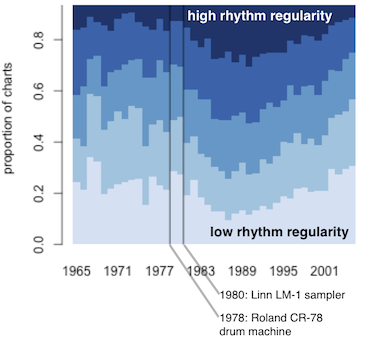 Instead, we found a regularity hump, right at the beginning of the 80s: the dark blue area shows the proportion of the charts in every year that is taken up by the most rhythmically regular tracks. Around the start of the 80s, the proportion of the most regular tracks increases noticeably, while the proportion of the most irregular ones diminishes. What could have fuelled this trend? One obvious suspect is the introduction of new technology. We have marked the release date of the first widely used drum machine, the Roland CR-78 in '78, and the first influential digital sampler, the Linn LM-1 in 1980 in the figure. We can't prove the connection but it's certainly a striking coincidence. Why does the proportion of highly regular tracks wane again in the mid 90s? Maybe people were fed up with very rhythmically regular music, or maybe drum machines simply got better at producing more diverse rhythms. In either case, if this hump is really related to drum machines and samplers, we'd expect to see the trend in other kinds of data as well. As the 80s seems to have been an unusual time for rhythm, it would be no surprise if we also saw striking things in the tempo of 80s music. We ran our tempo tracking software on the whole charts collection to measure the tempo of each section of each track in beats per minute (bpm). We then picked a single bpm value for each song by choosing the one attached to the most seconds of audio. 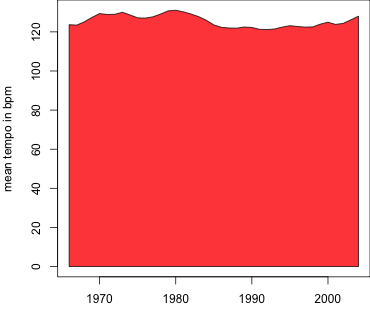 At a first glance a plot of the average tempo per year didn't look very interesting (you can see it here). But then we noticed something unexpected. Have a look at the image below. 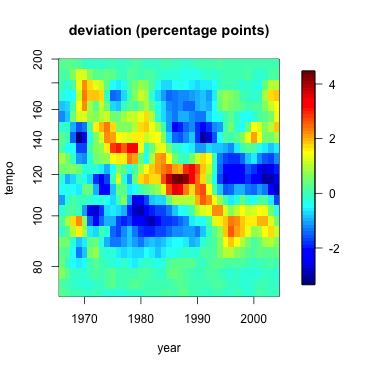 The heat map above shows you which tempos (in bpm) were unexpectedly popular in which years. For example, see the dark orange dot around tempo 100 in 1969? 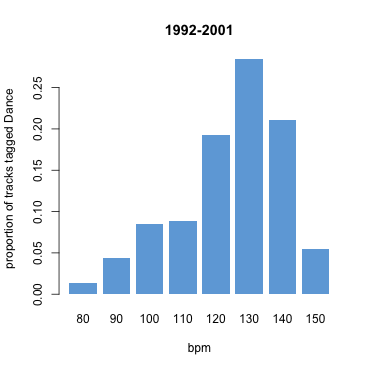 That means that tempos around 100bpm were more popular than usual that year (up by more than 2 percentage points). Admittedly, what's more striking is that there seems to be a downward pattern, as if some kind of music was getting slower and slower over the years. There's also a a strange cluster of tracks around 120 bpm from the early 80s to the early 90s - the big red blob in the middle. Before we ask what this cluster means, let's make sure that this trend is really there, i.e. 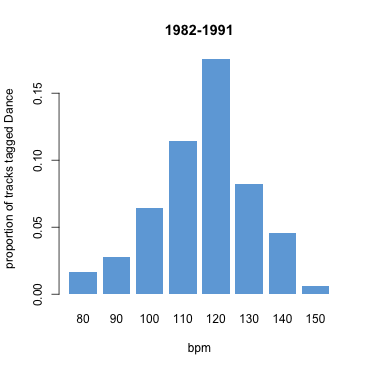 that the proportion of tracks around 120 bpm is really higher from 1982 to 1991 than in the rest of the time. 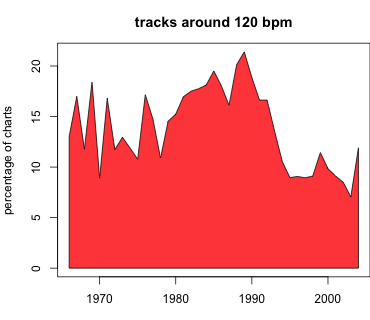 It may seem obvious from the figure below, which plots the proportion of tracks between 116 and 124bpm over time. To be really confident that this is not due to chance we use a statistical test, a "2-sample test", which can check whether the difference is significant... and it is, with 95% confidence we can say that the difference is between 5.5 and 8.1 percentage points (details). In this track the KLF follow their own advice. So was the drum machine a curse? It's been a blessing for many dancers, and it has undeniably led to the emergence of whole new genres of music, often dance music. And dancers have taken it from the club to the charts. Incidentally, somewhere along the way they must have learned to look cool even at higher bpm rates... what we see for the years 1992 to 2001 suggests a rather radical change to quicker dance music quite different from the KLF's suggestion that the tempo is "creeping up". Check the figure below. Dance music in the 90s has clearly moved on, even the songs that did get into the charts, and its got faster. However, there seems to be another current of music that counter-balances this, as our tempo heatmap further up suggests (though it doesn't prove it). As a reward for trying to understand all our data visualisations today we leave you with two of our new multi-tag radio stations. Next week, bring some some earplugs, as we will try to find out where all the racket comes from in The White Noise Boys [Edit: title changed to Survival of the Flattest]. The original article on the Fluctuation Patterns feature is by Elias Pampalk, Simon Dixon, and Gerhard Widmer: On the evaluation of perceptual similarity measures for music. In Proceedings of the Sixth International Conference on Digital Audio Effects (DAFx-03), pages 7–12, 2003. If you want to detect the tempo of a track automatically, try Matthew Davies's tempo tracker in the Queen Mary Vamp plugin library or Simon Dixon's BeatRoot. The net slowdown in tempo almost certainly has to do with the increasing popularity of rap. Rap music isn’t nearly as fast as most pop/rock/dance/whatever songs. Very nice reading not sure what the benefit is to Last.fm listeners but I guess it must be to predict which unknown song we might want to listen to next? That the slowdown starts at the end of the 60s is surely not due to Rap it did not exist then, maybe Reggae but Ska was also available before and after 1970. I would say that Ambient is most likely the influence that started around then and over time gained popularity followed or transforming into New Age? I would even go so far to say it’s down to the introduction of Moog synthesizers in the mid/late 60s. I assume people started experimenting outside the Pop / Rock format to create that Ambient sound. Hey Vincent. Good catch, it’s been updated now. I was a DJ from 83 to 2004 and I definitely had the same thoughts as what your results display about tempo. I was working with funk, dance, reggae, dancehall, ragga, soul, techno, and drum and bass. Aside from the 120 peak I had a lot of tracks at: 88, 92, 96, 100, 104, 108, 112, 116, 124, 128 and 132. Drum and bass being often in the 140 to 160 area. Thanks for this post; interesting read. I wonder if part of the decline in regularity is due to people moving away from drum machines and toward software sequencers and samplers. If you open any typical four-on-the-floor dance tune in something like Ableton Live, you’ll see that it’s not uncommon for the tempo to be inconsistent. In putting together studio mixes, I often have to nudge a track every 16 bars…sometimes a lot, sometimes a little. Could it be that drum machines have become more sophisticated and can now do swing and shuffle like a real drummer? Rap music’s influence has reached all genre’s I’ve noticed this marraige to r&b, pop and country. Thus calling for a slowwer tempo!foe example Nellies the longest yard! Thank you all very much for your input and experiences. It seems we’re quite a varied community here. Interesting thoughs and links! @ Peter and Robin: yes, I believe that it is probably true that drum machines got better. We are only tracking the low-level signal features here don’t even attempt a “proof” for such difficult findings… yet. Might take another few years till we’ll be able to do that. Continuing Peter’s thought from above, one of the factors being overlooked here seems to be an obvious one – who’s playing the drum part? In the mid 80s, with the emergence of drum machines, many musicians (at least in electronica) saw it as a way to become a one-man writing and recording entity. Because of the lack of appreciation for “rhythmic literacy”, many dance/electronic creators essentially abandoned the drummer. Over time, especially beginning in the early 90s, you begin to see a re-emergence of the drummer as musician in dance music. I suspect that they are still far less present during the writing and recording process in dance/electronica than in other genres of music. I’m curious to know if there is any data to explore that correlates tempo and these compositional factors with pop music over time? As a matter of disclosure, I was learning to drum in the early and mid 80s, and witnessed some of these phenomena first hand. I’d love to explore the insights into the musician drummer’s role in all of this! i read in last night a dj saved my life (bill brewster + frank broughton) – at least i think it was in this book! – that the significance of 120bpm in dance music is linked to the pace of the foetal heartbeat.